OCZ showed us its Kilimanjaro based Z-Drive R5 (native PCIe controller jointly developed with Marvell) running a 4KB random write test at Computex today. The drive was pushing as much as 800K 4KB random write IOPS, although by the time we got to the demo the drive had been dirtied to the point that it was delivering around 570K IOPS and over 2GB/s. The R5 features sixteen PCIe 2.0 x1 Kilimanjaro controllers behind a PCIe 3.0 x8 switch, enabling tons of bandwidth. 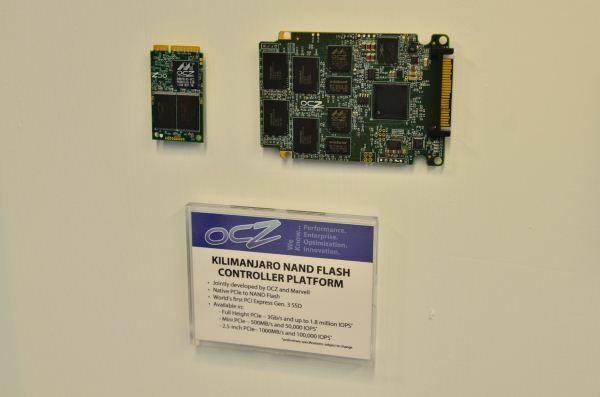 OCZ also had physical samples of its 2.5" PCIe and mini-PCIe Kilimanjaro platforms. Remember Kilimanjaro is a native PCIe SSD controller so there's no SATA to be found on the board. The 2.5" PCIe device uses a standard SSD form factor but with a PCIe connector. There are two controllers behind a PCIe switch on the 2.5" drive, while the mini-PCIe drive features a single controller. Is it possible to boot from these drives? I guess with a "normal" mainboard the answer is no?